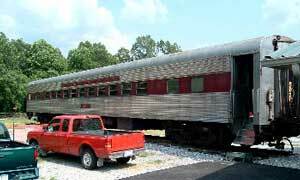 The Pullman Standard Car Manufacturing Company built Coach 2931 in 1950. It was one of thirty-four 44-seat chair cars ordered by the Santa Fe in February 1948. Delivers to the Santa Fe began in March 1950 through July 1950. Chair car 2931 was ordered by the Santa Fe for use on their train the EL CAPITAN. The EL CAPITAN was America’s first and only deluxe all-chair-car transcontinental train. The train ran from Chicago to Los Angeles in only thirty-nine hours and forty-five minutes. The term Chair car is intentionally used in place of the term “coach” because a chair car was specifically designed for long distance travel, had full extending leg rests, and the seat backs reclined fully. In most cases, a typical coach may lack leg rests, only have a footrest and only limited adjustment to the seat back. The Santa Fe, intended this to be on long distance trains for the duration of its life and therefore it was referred to as a Chair Car. The El Capitan was the only all-coach or "chair car" (non-Pullman sleeper) to operate on the Santa Fe main line between Chicago and Los Angeles. It ran on the same fast schedule as the railroad's premier all-Pullman Super Chief. All of the cars in the order featured Ride-Master seats with foam rubber cushions molded to body measurements; full leg rests that tucked under the seats when not in use. The seat arms were upholstered with fingertip controls releasing the seat backs to three different reclining positions. The window spacing in these coaches was rearranged for better vision than in previous coaches. The floors were carpeted with tones representing the desert sands of the southwest. The walls and ceilings were of pastel tones, which varied from car to car to avoid monotony. Contrasting shades were used subtly; old rose with red, buff with tans, olive with gray-greens, all highlighted by stainless steel and chrome trim. The sidewalls of all of the cars were finished in Flexwood veneers. The colors were accented by soft indirect lighting as well as individual lights over the seats. Coach 2931 ran in Santa Fe service until 1971, the year Santa Fe discontinued its passenger service completely due to lack of profits. On April 16 of that same year, Santa Fe signed a contract turning over their train names and 450 pieces of their passenger equipment, including coach 2931, to Amtrak.The Santa Fe cars represented a large percentage of the entire Amtrak fleet at the time. Amtrak retained the EL CAPITAN name until 1973. Amtrak renumbered coach 2931 to 4534 and continued running the car until 1982. The Heart of Dixie acquired No. 2931 from an Amtrak auction in 1982. One of the first things done to the car, though minor, was to renumber it back to its original number of 2931. The first major change was to remove the original solid windows and replace them with sash windows that can be raised. This was necessitated because the car’s air conditioning system is steam driven, not electric.